Darwin’s conundrum: Where does compassion come from? ALTRUISM PUZZLED puzzled Charles Darwin. If evolution was propelled by natural selection — by the gradual predominance within species, including Homo sapiens, of those individuals best adapted genetically for survival and reproduction — where do generosity and compassion come from? Why don’t societies grow more pitiless and cutthroat over time? How did selflessness, charity, and integrity ever establish a foothold, let alone become moral virtues that all enlightened communities esteem? Charles Darwin struggled with a paradox: If evolution is a struggle for survival, how could generosity, compassion, and other altruistic virtues have spread through natural selection? Darwin’s paradox has generated a vast literature in evolutionary psychology and sociobiology. Scientists have demonstrated that humans have a hard-wired moral capacity; we are born with an aptitude for empathy and fairness that is built into our biology. Recent neurological experiments, for example, demonstrate that an act of generosity, such as donating to charity, triggers a pleasurable response in the brain. Of course, having a capacity is not the same as using it. The human brain is hard-wired to learn multiple languages, too, but how many of us ever master more than one? Our moral sense may be genetically encoded, but we aren’t robots. We have free will. Each of us must choose to be decent or indecent. And there is no denying that indecent choices can also convey rewards. As Jews this week celebrate Rosh Hashana, that message will be renewed. In the Jewish tradition, Rosh Hashana marks more than the start of a new year. It is the day when God sits in judgment over mankind, weighing each person’s deeds and misdeeds, deciding who will live and who will die, whose year will be tranquil and whose tormented. More than at any other time in Jewish life, the 10 days from Rosh Hashana through Yom Kippur, the Day of Atonement, reinforce the conviction that everything we do is seen and recorded, and that we are called to account for our choices. Yet God is not immovable. Over and over, the High Holiday liturgy stresses the power of repentance to overturn a harsh decree. And repentance is achieved not just through prayer but through acts of charity, goodness, and honesty — through behavior changed for the better. However cynical, Voltaire was right. Human beings are more likely to do the right thing if they think they’re being watched, which is why speeding drivers slow when they see the flashing lights of a police cruiser, and why visible security cameras reduce shoplifting. Surveillance changes behavior. Even the illusion of surveillance — a cardboard police officer, a poster of staring eyes — can make people more honest. Religious believers know that they are being watched not by an inanimate camera or a poster, but by an all-knowing God who calls us to love our neighbor, feed the hungry, and pursue justice. 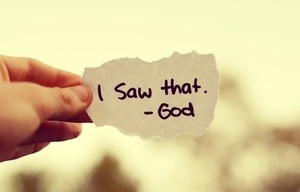 “God sees. Therefore we are seen,” writes Sacks. That is a powerful spur to improve our deeds; to take right and wrong seriously; to be honest and ethical even when others aren’t. Our genes may be selfish. We can aspire to something higher. This entry was posted in FAITH, GENETIC DETERMINISM, JEWS and tagged PHILOSOPHY, Religion, science, survival of the fittest darwin. Bookmark the permalink. Jesus Christ, being a good, observant Jew, made many allusions to altruism and generosity in his preaching. His parable of the Good Samaritan is but one example. His injunction to not let your right hand know what your left hand is doing when you give alms stresses that it is more important that God sees our altruism than that one should receive recognition and human respect from others. Charles Darwin’s struggle to account for the altruistic motivation of humans in many of their actions is but another example of the limits of science to explain everything about human nature from his observations of the process of natural selection. Be neither a worshiper of science nor its enemy.